Luccombe Manor Country House Hotel is a stunningly located coastal hotel on the Isle of Wight. This beautiful establishment in Shanklin stands high on the cliff top, boasting the most magnificent seaviews over the neighbouring Sandown Bay. This family and dog friendly hotel is just a 2 minute walk away from all the hustle and bustle of Shanklin Old Village and the award winning beaches. 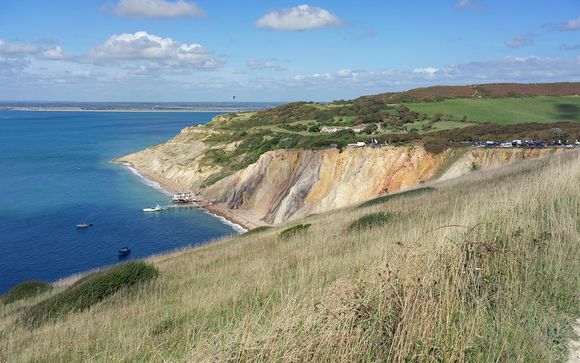 The Isle of Wight has been a magnet for family holidays for decades - and it's easy to see why. Try freshly caught seafood in fishers' cafes, have a go at countless outdoors activities and admire the 67 mile shore lined with beaches, dramatic white cliffs and sand dunes! This family run hotel prides itself on a warm and friendly service, making you feel special as soon as you walk through the door. Guests here can admire wonderful views of the sea, experience delicious dining in the restaurant and lovely refreshments in the the Grand View Tea Gardens, which boast panoramic views of Shanklin and Sandown beaches. 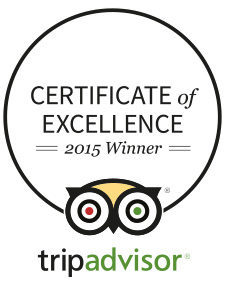 Luccombe Manor is the ideal family getaway. Sit in the lounge and watch the yachts and ferries pass by. Relax in the outdoor hot tub, take a swim in the heated pool (in sister hotel), cool off in the games room or wander through the beautiful gardens! 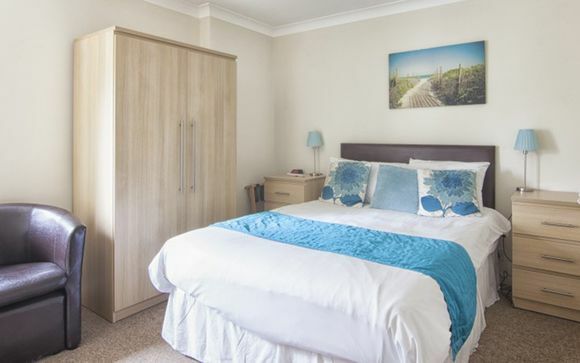 Rest easy in a comfortable room that is pleasingly decorated and prides a superb base for a holiday in the Isle of Wight. Glass of Prosecco pre dinner 1st evening. 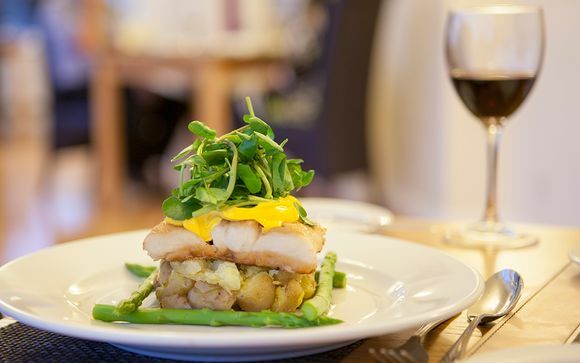 The Appley Restaurant serves a wonderful array of freshly prepared mouthwatering meals at breakfast and dinner each day, using many locally sourced ingredients. After a day of sight seeing or relaxing on the beach, come back and enjoy a delicious dinner in the splendid Victorian dining room with large windows offering stunning sea views. The Dining Menu changes regularly and always includes a vegetarian option. Special diets can usually be catered for with 24hrs advance notification. If you're coming on holiday to just relax and take things easy, then Luccombe Manor Country House Hotel is the place for you. Occupying a tranquil location, you will slip into a world of peace and serenity, where the pace is unhurried. Nothing beats chilling out in the outdoor hot tub with a glass of bubbly! At Luccombe Manor you are never short of things to do, as combined with adjacent sister hotel Luccombe Hall, you have access to more facilities than any other hotel on the Isle of Wight! Follow the flow of traffic to the set of traffic lights. Turn left, and follow the main road into Ryde. Once in Ryde, follow signs to Sandown and Shanklin. This will take you on to the A3055, out through Westridge and past McDonalds Drive In and over the Tesco's roundabout. After approximately 3 miles you will go through Brading, follow the main road through and out across a set of traffic lights. As you come into Sandown, turn right at the Broadway Garage mini roundabout and head up the Broadway. After approximately 1 mile, you will go through a set of traffic lights and past the Heights leisure center on the right. Follow the main road through Lake and through the large set of traffic lights. Follow the main road again for approximately 3 miles, this brings you in to Shanklin. Stay on the main road through the town, and, after approximately half a mile, you will go up a steep hill to some traffic lights with The Mad Cow Bar & Restaurant on the left and the tourist information office on the right. Go straight through the traffic lights and down into the Old Village of Shanklin, through the bends in front of the Holliers Hotel and out of the Old Village. After approximately 200 yards, turn left in to Priory Road. Take the first left on to Popham Road and drive to the end of the road, to your left will be Rhylstone Gardens and tucked in the corner on your right you can find Luccombe Manor. Follow the traffic out of the terminal to the roundabout. Take the first exit off the roundabout direction Newport. Stay on this road for approximately 10 miles, you will arrive at a big roundabout at the top of Newport. Take the third exit and travel down the by-pass to the Coppin's Bridge Gyratory. Take the direction for Sandown and Shanklin, and stay on this road for approximately 7 miles, you will travel through Blackwater, Arreton, and Apse Heath. After 7 miles, you will come to the Safeway Roundabout at Lake, go straight over and then take the first turning on the right (after Spithead Business Centre). Follow this road in to Shanklin town center. You will go past the fire station, police station and Somerfield Supermarket. The road will then become one way and come to a T-Junction with an estate agents on the right. Turn right here and head up the hill to a set of traffic lights. Go straight through the traffic lights and down into the Old Village of Shanklin, through the bends in front of the Holliers Hotel and out of the Old Village. After approximately 200 yards, turn left in to Priory Road. Take the first left on to Popham Road and drive to the end of the road, to your left will be Rhylstone Gardens and tucked in the corner on your right you can find Luccombe Manor. Ferries from Southampton run every hour and a half. Guests need to call or email the hotel with their preferred sailing times and the hotel will book the ferries and email the guests their ferry tickets.